Jair Bolsonaro with his son Eduardo. Wikimedia Commons. "The left must kick-start a response substituting insecurity for collective action and hope." On October 12, 2014, a group of artists convened in São Paulo to support Dilma Rousseff, the presidential candidate for the Workers' Party (PT). Artists like Otto, Karina Buhr and Lucas Santana expressed their critical support for Dilma in an event called Thirteen Shades of Red. Aécio Neves, the conservative Brazilian Social Democracy Party (PSDB) candidate, was leading the polls. The polarization of the campaign had been building up. The candidates were now adopting a visceral tone. You could sense the hate. Fear was being invoked. Both sides were betting on binary thinking. Some minority currents within the PT were trying to update the party's narrative with initiatives such as Podemos Mais, to try connect with the massive protests of June 2013. But Dilma Rousseff’s official campaign was a steamroller compressing the new narratives and practices which had emerged since 2013. The Thirteen Shades of Red event was a breath of fresh air in the midst of the electoral quagmire. It sent a message to supporters of the PT's unitary slogans and traditional symbols. Red of course, but thirteen shades of it. The man behind the concerts’ lights and aesthetics was activist Paulinho Fluxus. Paulinho, who does not hide his leftist leanings, had been going around São Paulo for years dressed in pink, pushing a supermarket cart filled with plastic cannons. Pink was his new red. "That colour of fragility can become mighty. A supermarket trolley can stand up to fifty shock troopers and come out winning in the final picture", he claimed in 2013 in Folha de São Paulo. During the June days, Paulinho Fluxus and a group of activists fired a laser from a skyscraper right onto a Rede Globo’s newscaster face in São Paulo. His "aesthetic shots", which forced the presenter to mention the demonstration that was going on at that moment close to the TV station, served as a metaphor for the polyphonic, fragmented and decentralized revolts in which all unitary messages were discarded. Both the right and the left tried to appropriate, unsuccessfully, the June days. Dilma Rousseff’s presidential campaign in 2014 tried to wipe out the heterodox character of those protests. Forcing polarization against its traditional enemy, the PT's aim was to control the game board. Whipping up fear of the right brought critics from the left back to the fold and Dilma won the elections. But the PT's strategy had unexpected consequences: an extreme anti-PT feeling which eventually crystallized in the form of a false outsider, Jair Bolsonaro. Whipping up fear of the right brought critics from the left back to the fold and Dilma won the elections. But the PT's strategy had unexpected consequences: an extreme anti-PT feeling which eventually crystallized in the form of a false outsider, Jair Bolsonaro. On the other side of polarization, a monster was born. A new, different monster with a thousand heads. A hyper-fragmenting monster that would end up winning the battle by eschewing face to face combat. In 2015, the demonstrators at the marches against Dilma defended, paradoxically, progressive guidelines and rejected the presence of politicians. These protests created an atmosphere for the June 2013 fragmentation which the PT disregarded. They "buy clothes" in Miami, he said, and we "by buy them at 25 de março" (a popular São Paulo street market). Left or right, red or blue, good and bad. He did not suspect that his definition of a closed "us" was in fact feeding a vigorous, inclusive and diverse "them". The "we" was wearing only red. The Brazilian flags waved by “them” at demonstrations were already 1001 shades of green-and-yellow and the demonstrators chanted 1001 cries of outrage. A few months ago, Jair Bolsonaro's campaign was just a slogan: "Brazil above everything, and God above us all". Nationalism and religious morality. Family as a space for action. Fear lurking in the background. Bolsonaro's aggressive attacks against the left were the fuel. The simplicity of the campaign favoured appropriation. The people themselves created the messages, the memes, the videos. Everything was worthy, everything fitted. Aesthetics, fonts, claims of all sorts. 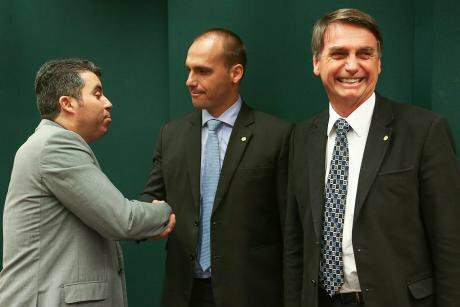 Civil society's techno-political self-organization which had characterized the 2011 cycle of the occupied squares happened to be, in the Brazilian case, on Bolsonaro's side. Whereas the campaign of the PT was built on unitary messages of inclusion, justice and equality, Bolsonaro offered different, segmented speeches to address different audiences. And people broke the messages up and circulated them. Here lies a major lesson for the left. Progressive intellectuals make manifestos; the far right encourages people to make videos and come up with memes for family WhatsApp groups. The left speaks about high ideals; Bolsonaro, Trump or Salvini deliver explosive speeches full of emotion, pride or violence. Indeed, they make use of fake news. But the political lesson to extract here is not that they lie, but that disinformation fits perfectly with people’s real discomfort, wishes and subjectivities. "Alternative facts are affective facts, bits of information evoking a feeling that is preferable than the truth underlined by facts", writes Peter Zuurbier in a recent article, an academic who does research on affective theory. The paradox is that the far right candidates appeal to order while sowing chaos. They present themselves as saviors after using a military strategy called psycho ops, which has been introduced in election campaigns by the SCL Group, the mother company of Cambrigde Analytica, accused of encouraging Brexit and helping Donald Trump get elected. If the new left abandons its anti-establishment tone, the far right will fill in the vacant space strategically. If it were to talk only about order, it would lose its voter base. The great challenge for the left is to be able to present itself as an orderly solution to chaos while maintaining an anti-establishment tone. On the other hand, not only does the Fascist label not fit with the hyper-fragmented reality of the 21st century, but it is almost harmless. Evoking anti-fascism awakens popular resistance for the most politicized sectors of the population, especially in Europe. But it seems inadequate to face the far right’s thousand-headed monster. The maximalist discourse against fascism is not efficient against the millions who vote for the far right and do not consider themselves fascists. The maximalist discourse against fascism is not efficient against the millions who vote for the far right and do not consider themselves fascists. As long as anti-Fascism remains a discourse and not a practice, a set of slogans and not neighborhood community action, the far right will keep on growing by presenting itself as a solution to people's concrete problems and fears. In his campaign speeches, Jair Bolsonaro mentioned constantly the "simple citizens". He also alluded to the cultures that are ill-considered (such as sertaneja or caipira music) and to forgotten regions (like the Midwest and the Amazon). Bolsonaro won a landslide victory in these regions, forgotten and stigmatized by the progressive cultural elite. The brega Brazil (a term used for anything considered tasteless or tacky) raised its voice and voted. Brazilian journalist Leando Demori points out that Bolsonaro has brought into the fold the "less literate" people, the people who according to the left do not "have the level of education required to know what a transgender person is", or do not understand the priority of bike lanes. Bolsonaro's core constituency is class C (lower middle class), just as Trump's or Le Pen's are the working class sectors confused and disoriented by globalization and ignored by cultural elites. The moral superiority of the left, which stigmatizes "right-wing workers", the unfortunate cultural decisions of the favela dwellers or the inhabitants of the Empty Spain described by Sergio del Molino, widens the gap. Talíria Petrone, who got elected member of the Brazilian Federal Congress for the Socialism and Liberty Party (PSOL) in Rio de Janeiro, is categorical: "the left must go back to the territories, not to carry any truth, but to listen". The assertion applies equally to all of the world's metropolitan areas and rural regions. Bolsonaro's boom in the most violent territories is related to the rise of the Evangelist churches. While progressive organizations were losing space in the favelas and in inland Brazil, the Evangelical churches were building a real mutual support and solidarity community network. Even though some progressive Evangelical currents - such as the Integrated Mission Theology - do exist, the left has stigmatized the Evangelical world, and this has resulted in practice in an Evangelical-run monopoly of social action in many peripheries. The left, if it wants to dispute disenchantment in the peripheries, must go back to the territories. Listening, building spaces to live in, facilitating self-organization without co-optation. The left in Spain has to also tolerate the tastes of the popular classes, however "unfortunate" it may consider them to be. Otherwise, Hurricane VOX will grow and grow. The Homo Velanime collective is right in urging the "in-lawing" of political language, by which they mean that it is crucial to dispute the political field of the family. A progressive family discourse, especially in Latin America and Southern Europe, may be more useful to dispel fears of the future than the great values of the left. After the shock at the first round of the elections, the PT's campaign changed radically. The green-and-yellow flag replaced the red one. It was a delayed reaction to Bolsonarism, which had taken control of the Brazilian flag. Since the June 2013 revolts, the left had distanced itself from the patriotic symbols. From 2015 onwards, the green-and-yellow tide tide grew, and the flag and the Brazilian Football Confederation (CBF) T-shirts became its icons. Abandoning the flag, in a nationalist country where even candomblé terreiros have their own flags and national football team is a religion, was the PT's catastrophic mistake. The right is taking advantage of identity patterns, especially of nationalism. Its economic nationalism, however, is a falsely inclusive, cheater patriotism. Disputing national symbols, resignifying them, weaving alliances with citizens in other countries, is one of the most complex tasks facing the left. To avoid falling into simplistic nationalist populism, the strategy should combine popular and citizen narratives. Popular and red tinted narratives (even anti-fascist ones) for the already politicized. Multiple citizen narratives for a new mass of people who prefer specific campaigns to constant activism. Hyper-segmented discourses to win over each of the publics of neo-fascism's highly fragmented Leviathan. At the same time, the new left in government must implement forceful public policies aimed at the new excluded sectors of the population (especially the impoverished middle classes), without losing its anti-establishment tone regarding the elites. And it must build digital and face-to-face platforms and devices to channel people's discomforts and to give a voice to all cultural manifestations, including the unfortunate ones. The left must kick-start a response substituting insecurity for collective action and hope. And it must bring forth a range of wishes larger than fear. This article was previously published by eldiario.es. Read the original here.